Detroit Gospel.com is on the scene at the 2006 Stellar Awards in Nashville, TN. The Grand Ole Opry at Opryland in Nashville, TN, was the scene for the taping of the 21st annual Stellar Awards for gospel’s best and most notable artists. Many came from near and far to participate in the show and Detroit was in the house and making its presence known. Thursday night was the kick-off night where the radio announcers and personalities were showcased and honored. Many artists performed through the evening with hor d’ouerves being served and God’s praises going forth. Dr. Bobby Jones was our host for the evening’s festivities. Some of the artists I had a chance to see and greet were: Michael and Regina Winans, Paul Allen of PAJAM, Dottie Peoples, Donald Lawrence, Dietrick Haddon, The Rance Allen Group, Mary Mary, and Men of Standard – to name a few. Later at Mt. Zion Baptist Church, there was a comedy night with wonderful gospel comedic talents having the audience doubled over with laughter. A couple of the comics that stood out were Small Fire (formerly known as “Small Frie” who was her usual hilarious self; her talent is also showcased in Robert Townsend’s Partners in Crime: The Next Generation, to be aired on The Black Family Network) and, a giant in comedy…who is that guy!? Why it’s John Gray. This brother had us rolling on the floor with his sidesplitting antics. Friday Night was the busy night as the pre-announcement of the various categories took place. This was the night in which the artists’ names were read so that the attendees knew who the competition was. Some of the awards were presented that night to aid in keeping the televised version within the given time parameters. At the pre-announcement, each artist was called to the stage where they were presented with nomination certificates. A few of them walked away with their awards. The night was electrifying. Detroit reigned supreme in the amount of nominations and winners announced that night. Saginaw, Michigan’s own RiZen gave a “stellar” performance during the presentations and left the audience on its feet and begging for more. God was truly in the blessing business and rained down heavily on our Detroiters. Then the night of anticipation had finally arrived the following evening. The adrenaline was running high and Detroit Gospel.com was busy with Renee’ and Karen Hunt-Barker snapping shots of the many winners and nominees – especially our delegation from Detroit. I was busy in the interview room with other radio and online reporters speaking to the artists who came by to speak with us. They talked about their longevity and how they have been blessed in the gospel music industry, their thoughts about the music that is being recorded from our younger generation of gospel artists, and their thoughts on the influence that the current artists are having on the younger generation. Yolanda Adams responded to a reporter’s question about how gospel music is sounding and becoming more like secular music and how much of the difference is the responsibility of the artist. 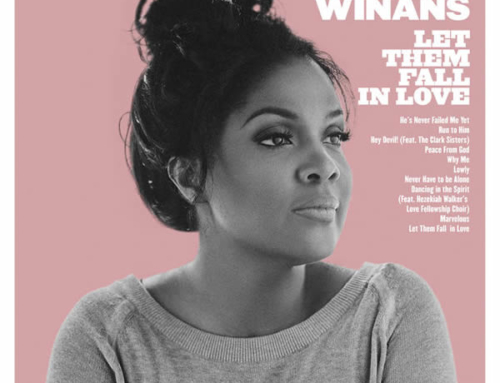 She said that when she or any artist writes or records a song, it is not written or recorded with the intention that it will only appeal to the younger generation or be a crossover song. An artist yields to where and how the Lord directs the music to go. If it crosses over with the message of the Good News of Jesus Christ, regardless of whether it sounds urban/hip-hop, traditional or contemporary to the masses, that is how God intended the music to bless His people. I totally agreed with her response. Tye Tribbett was one of my favorite artists who shared with us about the direction in which he and his choir GA are going in the future. Some of his audience, he has noted, thinks that his ministry is about being animated and entertaining when in reality he and GA are dedicated to getting God’s message to God’s people. I asked him whether or not he plans to increase his visibility in the preaching ministry, reminding him of the blessing he was to me and others who attended the Wednesday night service at Dr. Dorinda Clark Cole’s Singers and Musicians Conference in Detroit, and I asked if others are aware that he is a minister of the spoken gospel. He said that he did indeed intend to increase the visibility of his preaching ministry and possibly slow down his musical renderings so additional brothers and sisters of Christ can be blessed. He did not want the gospel industry just to perceive him and GA as “that energetic group,” but to listen to what they are ministering and absorb the life-changing message the songs bring forth. Other artists who passed through were Apostle Daryl Coley, who shared how he incorporates his jazzy sound into the anointed music we have been blessed to hear in our CD players and on the radio; and the Rev. Andre Crouch, who shared his vision of making the music of the Gospel more universal where artists appeal to every ethnic group and not just, for example, Latin artists appealing to the Latin audience or Asians to the Asian audience. He believes that all of God’s music should bless us all. Michael W. Smith also stopped by to expound on his activities and vision within the gospel music industry through various genres. Chante’ Moore and Kenny Lattimore shared with us how they have developed a sense of choosing friends and associates who have the same beliefs as they do and are striving in the same direction to please God. I asked if we could expect a gospel CD featuring their collaborative efforts. The beaming couple stated that there was something in the mix and that we should look out for the CD soon. J. Moss shared how he feels about the responsibility of the legacy of his aunt, Dr. Mattie Moss Clark and his dad, Bill Moss, Sr. and how it is now being passed on for the legendary Clark Sisters to continue with him and his cousin, Kierra “Kiki” Sheard, at the standard set. The night was topped off with the announced winners in each category. The Rev. Jessie Jackson set the tone for the evening with a spirit-filled prayer, and then the celebration began. 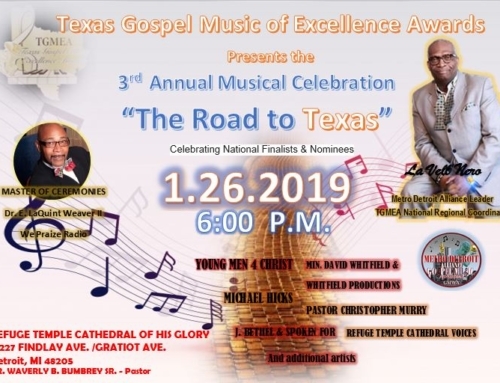 Gospel diva and funny lady Vickie Winans, and last year’s Stellar Award winners Donnie McClurkin and Israel Houghton were the night’s hosts. The musical performances were great and the presenters were wonderful. Detroit was represented in great numbers with the amount of nominations that were garnered by the artists we all love. In two very special categories, Detroiters were bestowed with distinctive honors. The James Cleveland Lifetime Achievement Award went to one of the first families of gospel and Detroit natives, The Winans family. The award goes to trailblazers in the gospel music industry, and this family certainly deserved the recognition and honor. 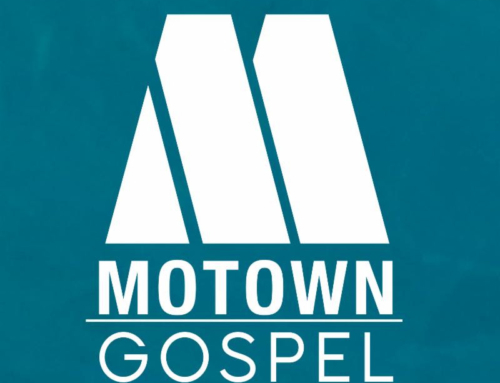 The presentation was spectacular and brought co-host Donnie McClurkin to tears when Chante’ Moore, Kenny Latimore and RiZen did a special musical tribute to honor the late Ronald Winans. Also, Fred Hammond was dubbed the “Renaissance Man” when he was given the “Most Notable Achievement” award for all of his pioneering efforts in the gospel music industry and the avenues he has provided for up-and-coming talents. Another family of gospel from Detroit, the Moss-Clark family, were well- represented in the number of nominations they received and number of wins achieved by them. The Moss-Clark family has been an integral part of the gospel music scene as a result of the work of Dr. Mattie Moss Clark and her brother Bill Moss, Sr. The legacy continues with the multi-talented Clark Sisters and Bill Moss, Jr., and continues on with J. Moss and Kierra “Kiki” Sheard. Kiki’s parents, Supt. J. Drew Sheard and Karen Clark Sheard, were on hand for the celebration as well as aunt, Dorinda Clark-Cole. J. Moss’s parents, Mr. & Mrs. Bill Moss, Sr., his brother and sister-in-law, Mr. & Mrs. Bill Moss, Jr., his niece, and other brothers, sisters and family members were on hand to share in the accolades J. Moss and PAJAM received. All of the “Mrs. PAJAM’s” were also on hand to celebrate their husbands’ achievements. J. Moss was awarded Male Vocalist of the Year and Contemporary Male Artist of the Year. Kiki won Contemporary Female Vocalist of the Year, and the group RiZen won Traditional Group/Duo of the Year. There was an “After” celebration where congratulations, hugs & kisses went on into the night. God was certainly in the blessing business at the 21st Annual Stellar Awards and He showed the world the treasures in gospel music that are housed right here in the Detroit area.